Pear-shaped diamonds offer a beautiful alternative to traditional princess cuts or round brilliant diamonds, and they make a lovely centerpiece in any engagement ring. Before you begin shopping for rings with this unique diamond shape, it's important to know what you're buying and get a sense of the styles available. Also called a "teardrop" or "pendeloque" shape, pear-shaped diamonds are a hybrid of round and marquise shapes. One side of the stone is rounded, while the other side tapers to a fine point. To create this beautiful modified brilliant cut, the master diamond cutter makes 58 facets in the gem. Since pear-shaped diamonds aren't as popular as more traditional styles, they cab make a striking and unusual statement. This style of cut lends itself to a variety of settings and side stones, so there are plenty of looks to choose from. If you select a ring with a longer pear shape, it visually slims and lengthens your fingers. Because of the many facets, a pear-shaped diamond doesn't require the same level of clarity that's necessary in simpler shapes like the emerald cut. As one of the four Cs of diamond quality, cut is an important factor when buying any shape of diamond. However, it's of paramount importance in the pear shape, which relies on perfect symmetry for its graceful beauty. The point of the pear-shaped diamond must be exactly opposite the apex, or highest spot, in the curved end. The sides must also curve identically toward the point, and they should not be straight at any spot along the edge of the stone. The "table", or flat surface of the diamond, should extend over 51% or more of the stone's girth. Ideally, the table will comprise more than 53% of the girth. When looking at the diamond from the side view, it should have a "depth", or height, that is at least 53% of its width. The best cuts will have a depth of 58% or more. The "culet", or pointed underside of the diamond, should be very small and come to as sharp a point as possible. With many shapes, the length-to-width ratio is an important quality factor in choosing a diamond. However, with the pear shape, personal preference may override what's traditionally seen as ideal. According to Blue Nile, this ideal ratio is between 1.45 an 1.75, but choosing a longer or shorter diamond won't affect its value with a pear cut stone. In fact, the optical effects, such as visually lengthening the fingers, make longer shapes very popular in this cut. Because the pear-shaped diamond is both thinner and narrower at the point, this part of the gem can take on a darker appearance in diamonds that have some color. This means that color is another important consideration when selecting your engagement ring. It's often best to make color and cut your top priorities when choosing a pear cut diamond. All other factors being equal, a pear-shaped diamond is more costly than many other shapes. According to Blue Nile, the pear shape is actually the second most expensive diamond shape, when keeping carat weight, clarity, cut quality, and color equal. This is likely due to the complexity of the cutting process. Because of its exceptional fire, prongs are one of the best ways to set a pear-shaped diamond, allowing lots of light to reach and refract within the stone. The point of the diamond is the most fragile part of the stone, so it's essential that this area is protected by a prong. You'll need a minimum of two more prongs to secure the stone, though six prongs are ideal for maximum security. Pear-shaped diamond rings come in many beautiful styles, from solitaires to rings with accent stones. The symmetry of the shape lends itself to a wide variety of gorgeous designs. One of the most common settings is a simple solitaire that highlights the stone's unique shape. In solitaires, the diamond is typically set perpendicular to the ring's band to enhance its length and size. Rings come in all kinds precious metals to suit anyone's taste. Pear Diamond Solitaire Ring - This beautiful ring from the Jewelry Exchange features a 3/4-carat pear-shaped diamond simply set on a 14k white gold band. 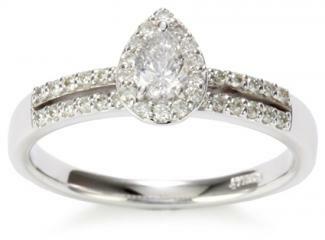 The stone is securely held in place with six prongs, including a protective prong at the tip. It retails for about $3,100. Cathedral Pear Diamond Solitaire - A graceful cathedral setting accents a 0.90-carat pear-shaped diamond in this beautiful ring from World Jewels. Six prongs hold the gem in place. You can choose from a variety of precious metals, including 14k yellow gold, 14k white gold, and platinum. Prices start at about $1,900. Classic Pear-Cut Solitaire - In this beautiful ring from Crown Jewelers, a 1/2-carat pear-cut diamond rests atop a simple band of 14k yellow gold. This classic design features six prongs and retails for about $1,600. Accent stones can bring further attention to the beautiful symmetry of this diamond shape. Some rings feature accent diamonds, while others add color in the form of sapphires, rubies, and other precious gems. Styles range from three-stone rings to diamond halos surrounding the center stone. Pear Diamond Ring with Baguettes - This beautiful ring from King of Jewelry boasts a 2.01-carat pear-shaped center diamond flanked by two diamond baguettes, giving the ring a total weight of 2.37 carats. The standard setting is 14k white gold, but you can also choose from 14k yellow gold, 18k yellow gold, 18k white gold, and platinum. The retail price for 14k white gold is about $10,900. Paige Ring - This unique style from Gemvara features a 1.86-carat pear-shaped diamond with an oval-shaped ruby on each side. The setting is a glowing rose gold. This pretty design retails for about $14,800. 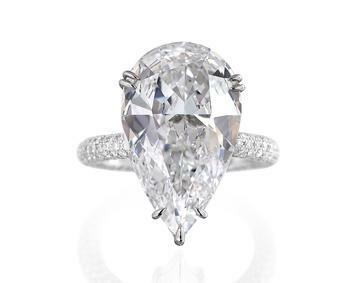 Traditionally, it's appropriate to wear the pointed end of the pear-shaped diamond facing toward your hand. This prevents the pointed end from catching on clothing and objects, and it offers some additional protection for the stone. However, some brides-to-be choose to wear the ring with the point out, which can visually elongate your fingers. Ultimately, there's no wrong way to wear your pear-shaped diamond. If you're interested in a twist on the traditional, a pear-shaped diamond engagement ring is a great option. With so many lovely styles to choose from and a little basic knowledge on this lovely diamond shape, you'll have a ring you'll be proud to wear for the rest of your life.